In the last several months there has been a significant push toward there being the inclusion of online betting in the state of Pennsylvania. During a hearing last week, Pennsylvania Gaming Control Board (PGCB) Executive Director Kevin O’Toole voiced an update on the plans for this expansion that will see online casinos being launched as it was pinpointed to be in the next few months. O’Toole estimated that it will take between three to four months for this major change to take place if not the next fiscal year, which begins on July 1. There was also an indication that it could begin as early as June. Parx Sportsbook Ready To Launch, What About Online Sports Betting? – Parx Online Sports Betting Ready? – Rivers Online Sportsbook Launch? Following weeks of anticipation, the Philadelphia Phillies have brought aboard star outfielder Bryce Harper into the fold. Harper’s addition has brought forth some significant changes to the betting lines around the team. The Phillies have been elevated across the board seeing potential World Series chances rise even more so after experiencing a huge step forward this past season winning 14 more games than the year prior. According to FanDuel Sportsbook, they have been increases to +1300 to win the World Series and +185 to win the NL East, which was a notable move from +1800 and +250 respective less than 24 hours prior to that. Harper’s arrival has now thrust them forward even more so toward being a potential real threat to come out of the NL in the playoffs. There are still several teams in front of them such as the Los Angeles Dodgers, New York Yankees, Boston Red Sox, and Houston Astros with the current betting odds, but the Phillies have seriously entered the conversation. Over the years, sports betting has increasingly become a more popular behavior with each passing generation. This has especially been the case with the most recent generations with millennials as it has become a norm among them. According to a recent study conducted by Bleacher Report, it has increased to one in three from that generation have attempted to try sports betting. They have embraced the numerous avenues that present themselves to this generation that have made it easier and more acceptable in this society. What it also found was that nearly 63 percent of respondents to the survey conducted by Bleacher Reported indicated they would pay more attention to games if legal sports betting existed in their respective states. This only makes the push for legalized betting across the country a stronger push given that this next generation has a strong push toward going that route. This study of possible bettors from the millennial generation in Pennsylvania speaks to the necessity to expand the use of betting toward online availability that could come into play later this year during the summer. The reason for this delay is linked to the servers as many of these casinos are waiting for the equipment to arrive and be tested and approved by the PGCB before it can get underway. Once that process gets going then things can be shifted in the right direction. All of this will take time, but it appears things are headed in the right direction for this process. Last week, it was announced that DrafKings and Caesars Entertainment had a huge partnership that will allow the former to entree into several sports betting and online gambling markets. However, this doesn’t include Pennsylvania as being part of that massive deal. It appears that the fact that Pennsylvania operators only have a single skin has kept DraftKings away from the state. However, this is just yet another partnership opportunity for them to broaden their horizons across the United States. The possibility of them working with Pennsylvania casinos is still a possibility at this point in time. There are other deals like the one the company has with Penn National that could see them expand to the state altogether. It does make that scenario more difficult, but it remains something that could happen down the road. 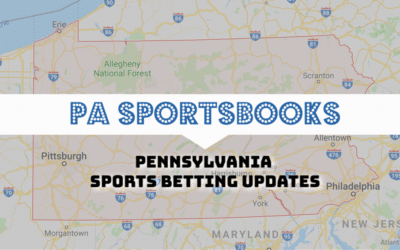 Is Sports Betting Legal in Pennsylvania? Yes. Pennsylvania legalized sports betting in 2017. After the Supreme Court repeal of PASPA, states like PA could move ahead or activate their sports betting regulations. Can I bet on sports via my iPhone or Android mobile phone in Pennsylvania? Yes. Online sports betting and mobile sports betting apps will be available in May 2019. You must physically be located within the PA state border to place a bet online. Does the high PA Sports Betting tax impact my winnings? No, the 34% state tax and local 2% tax is on the sportsbook revenue generated by the PA Casino who owns the betting license. What is the minimum age to bet on sports in PA? Anyone over the age of 21 can legally bet on sports in Pennsylvania via retail sportsbook or online/mobile betting apps.